for Doing a Behind the Blog Interview on FPTFY today! to read it all click and say hello click here!! It has been a delight following her lovely blog! I just cant help myself! There are SO many lovely things you can do with them! Adding a pretty little bird and fishing string brought it all together! You can add all sorts of things to it.. lots of possibilities! hi keren– great job with the hoops… really cute! thanks for being such a great interviewee! Loved your interview! I just think it is fantastic Malia is doing these interviews! Happy to have discovered you! 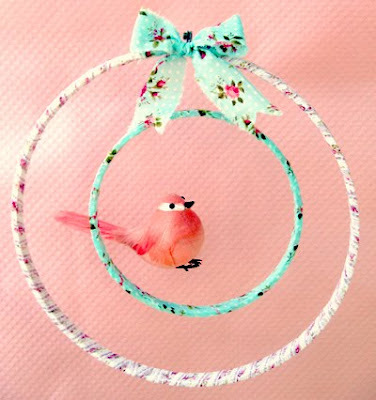 I adore that embroidery hoop and sweet birdie! This is SO adorable and seems so easy to make! Hitting the thrift stores for some hoops! How beautiful! You are one artsy-talented young lady! I love the bow baby onesie~ and I would love to win this!! This is such a cute idea!! I can see one of these hanging the doorway to my little girls room; she's gonna love it! That is so darn pretty, honestly it looks like something right out of Anthropolgie! I love it! and I do have some old embroidery hoops :) thanks for the inspiration! 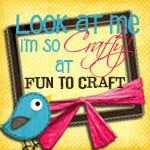 Thank you for joining us at A Crafty Soiree! I absolutely love how your craft turned out. It's so delicate, dainty, and girlish. It would be great for a nursery too! I hope you'll come back next week and link up again! So sweet! Perfect for a baby's room! Hey Keren, this is just as cute as can be. Makes me want to do a baby room every time I come over to visit your blog. I love the fabric and the colors and what a creative design. Congratulations on the interview! You have inspired to me to try this out for my house, I actually haven’t decided whether I will give it to my daughter or keep it for myself if it works out though. I am following you on BlogLovin’ and Pinterest and you are in my blog reading list as well. I am joining your link party this week and have placed your badge on my sidebar of my blog. I have only just started blogging on the last 2 or so months so still have so much to learn. Hope you can visit my blog sometime and let me know what you think. Your adorable embroidery hoop project for your little girls room is wonderful. I’d like to make it for our bathroom, hang it in front of window so breeze can blow it, will put some pretty ribbons on it also. It is such a great project and easy, inexpensive. I’ve been collecting hoops for while, have yet to make anything but will be watching out for pretty fabric scraps to put in them, make your project. Happy Easter and Happy Spring days.